"At the lower end of Longbrook-street is a small, village, partly in this parish, and partly in St. David's; in this hamlet are several genteel houses, with good gardens, in a pleasant retired situation, free from the noise and smoke of the city, yet almost contiguous to it; this place is termed Hill's Court, from a knightly family of that name who formerly had a spacious mansion there, and in which they lived with great splendor; it was long the residence of Sir John Sill, Lord Chief Justice of the Court of King's Bench: but it has long since changed its owners, and no vestige of the ancient house is now remaining." In the early 19th century, York Road only ran from Sidwell Street to Well Street. 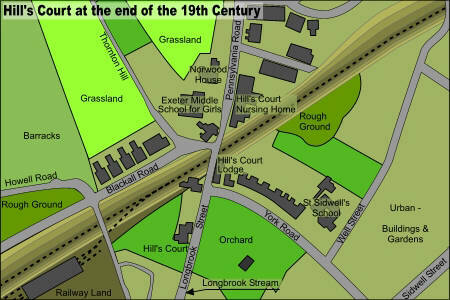 It was in 1855 that York Road was extended to meet Longbrook Street at Hill's Court. The Longbrook was a ford, isolating Hill's Court from the top of Longbrook Street and the city, and was once famously crossed in 1068 by William I with 500 horsemen, as he approached the East Gate, to lay siege to Exeter. The stream was culverted in 1843, as part of the initiative to clean up the city after the cholera outbreak of 1832. A terrace of houses, built in 1906, numbered 71 to 93 Longbrook Street were originally named 1 to 12 Hill's Court, after Hill's Court House, on whose site they were built. The private, triangular garden at the junction of Longbrook Street and Pennsylvania Road is now bounded by Queen's Crescent. This still green patch and the houses on the crescent were developed in 1898 on two largely empty fields. The only existing development was a small cottage and a slaughter house. Further along, where Queen's Court meets Longbrook Street is Harry's, now a restaurant and once the workshop of Harry Hems, the sculptor and wood carver, who specialised in church decoration. See 86 Longbrook Street - Harry's. Blackall Road was originally cut as a private road to join New North Road with Pennsylvania Road in 1872. 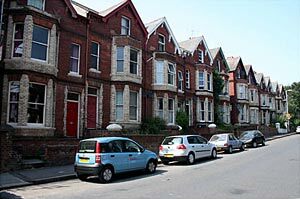 It was named in 1876, and widened by the City Council in 1877 as the first phase of housing was being complete. 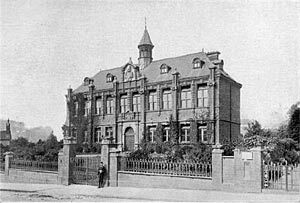 The Exeter College annexe, that was originally Bishop Blackall School was built in 1887 on the corner of Pennsylvania Road and Blackall Road. At the end of the 19th Century it was named the Exeter Middle School for Girls. A little further up Pennsylvania Road is Norwood House, a block of housing association apartments that are built on the former site of a Victorian mansion, also known as Norwood House. Mr Shorto, a former headmaster of Bishop Blackall School, and author of an Exeter history for schools, lived here in the 19th Century - his wife ran the Norwood Preparatory School from the house. The mansion was demolished in 1976. On the opposite side of the road is Hillscourt Nursing Home which dates from 1820 to 1830. It has a fine Tuscan style facade picked out in blue and dove grey. It was allegedly built by prisoners for John Powning, an Exeter architect who trained Charles Fowler, the architect of Covent Garden and the Lower Market. Source: Pennsylvania by Hazel Harvey, Jenkin's, Civil and Ecclesiastical History of the City of Exeter, OS 1890 and 1904 maps. 71 to 93 Longbrook Street replaced Hill's Court Mansion. 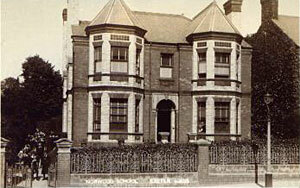 Norwood School The Exeter Middle School for Girls became the Bishop Blackall School.